The ContiTDS is set up outside of the container. 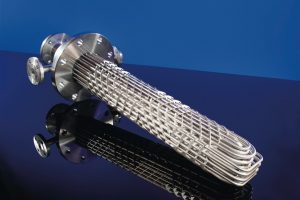 It moves the liquid in a cycle and suctions the powder in a dust-free manner. Preventing dust when powders and liquids are mixed together makes work safer. No cloud, no risk of a dust explosion. 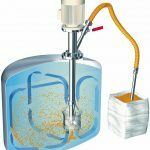 The Conti TDS and TDS Induction Mixer solve this problem by incorporating the powder into the liquid underneath the liquid surface, meaning no dust is produced. Wherever powders are used in industrial manufacturing dust is created. This is a safety problem in many industries because, with all organic or organic-coated powders and some metal powders, this dust will generally be combustible or explosive. Whether or not an explosion may occur in practice depends on the dust concentration in the air. If this concentration is between the upper and lower explosion limits, then it creates an ignitable dust-air mixture. An ignitable mixture can even be created with non-combustible and non-explosive powders if the powder is processed in a hybrid mixture with flammable gases and vapours present. In this case, the inflammable gas atmosphere between the powder particles is the source of the risk. 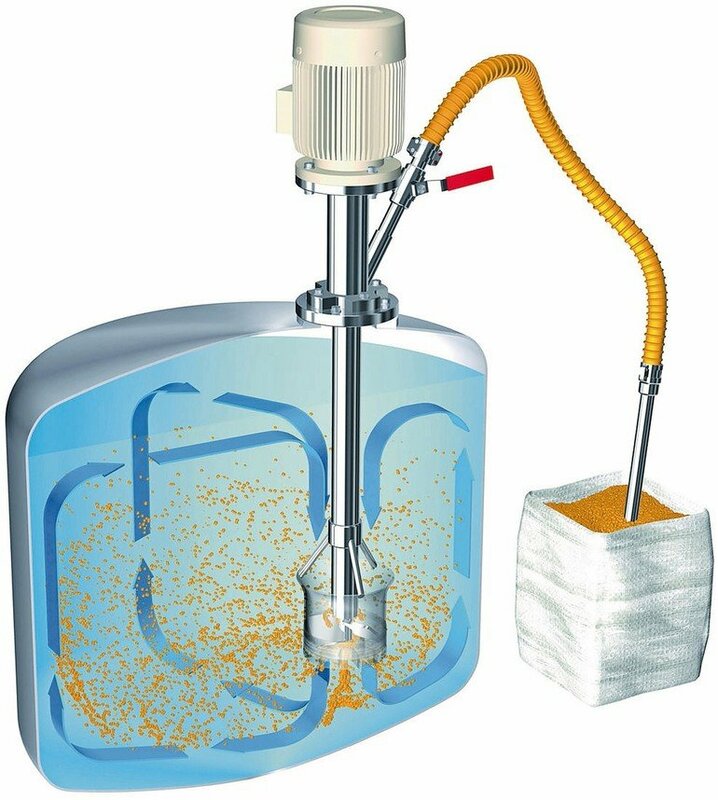 Things get especially dangerous when powders are poured into a process tank containing inflammable liquids with ignitable vapours above: the powder must pass through the critical zone where the mixture is easily ignitable. Ultimately, all it takes to trigger a dust explosion is an ignition source with a sufficient amount of ignition energy. One underestimated – and often overlooked – danger is the risk of electrical discharge in the flowing powder. Powder becomes charged when it flows out of a sack or hopper or simply through a pipeline. Hence, even conveying and pouring powders is risky. What many users and even valve manufacturers don’t understand is the risk caused by valves through which powder is flowing, since the internal ball or disc is typically mounted electrically isolated from the pipeline. Flowing powder charges these components differently, creating sparks. Consequently, even simple manual valves through which powder flows must fulfil all requirements to prevent dust explosions and have to be certified, even if they don‘t contain any electrical part. To ensure safety in production, therefore, any dust must be avoided. Outside of powder processing systems, critical dust concentrations can be reliably prevented with a suitable dust extraction system. However, when powders are conveyed into a process tank or sacks emptied onto a liquid, the dust-air concentration is always critical. The explosive volume depends on the rate at which material is added and the amount of dust created by the powder – factors which cannot be reliably controlled. With Ystral’s TDS systems, powders are inducted into the liquid in a dust-free manner. 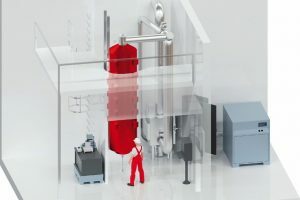 The induction vacuum is generated directly in the liquid itself. Once the combustible powder has been mixed into the liquid, there is no risk of dust explosion anymore. A TDS Induction Mixer installed inside the process vessel. 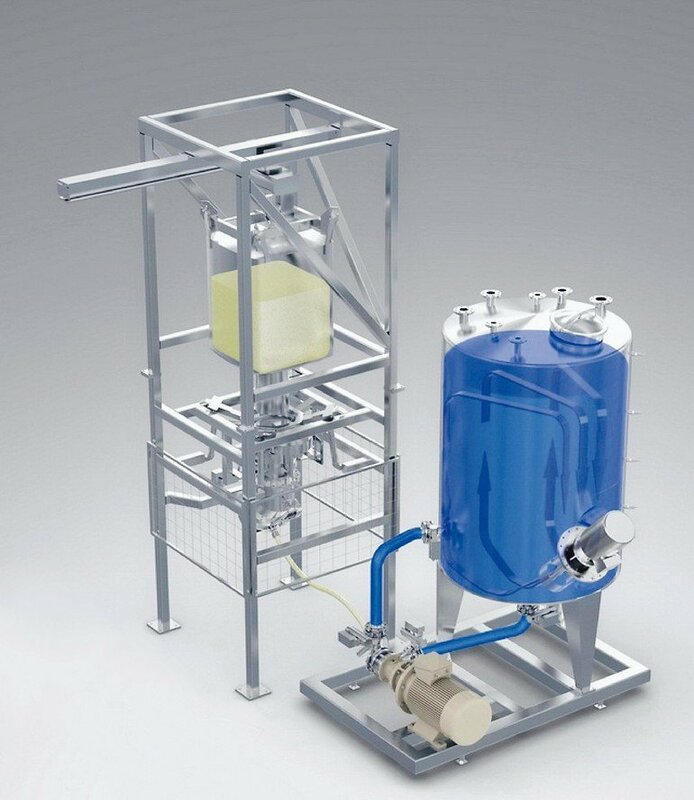 It creates a vacuum in the mixing head, which inducts and mixes the powder directly below the surface of the liquid. The Conti-TDS is much more universal. 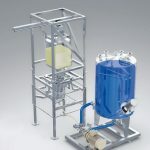 It is installed outside the process tank, recirculates the liquid in a loop and inducts it dust-free. 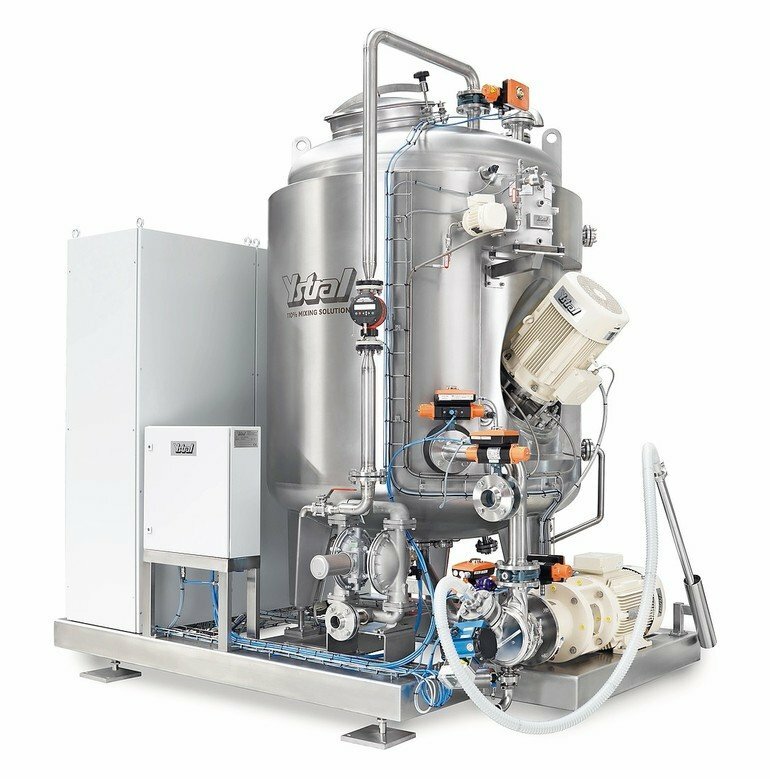 The machine can work with significantly higher viscosities, different batch sizes and variable liquid levels in the tank. 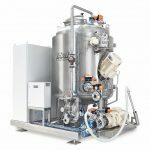 It can be set up separately from the process tank or connected to multiple tanks. Both machines are designed and certified in accordance with the relevant dust and gas explosion directives; they use only certified components and are suitable for both dust and gas explosive atmospheres. The systems are available with different Atex classifications as well as with IEC Ex and NEC certifications. One unique variation is designed for users who need to process dust explosive powders in non-ex-classified zones. This application is rare in the chemical industry but common in food, cosmetics and pharmaceutical production, where a large number of organic powders with the potential to form explosive dusts are processed. Dust explosion risks outside the processing systems can be prevented by taking suitable precautions. Inside the system, however, critical explosive dust atmospheres may be created shortly before the powder enters the liquid. Suitable TDS machines are available for here; they are internally fully dust-explosion safe and classified. But externally they are designed for installation in non-ex areas. A typical Ex classification is II 2D/ – cT200 °C, where the zone specification before the dash applies to the interior zone and execution, and the specification after the dash for exterior zone. These machines can be used to process dust explosive powders in non-ex classified areas. Stainless steel covers for electric motors or even entire machines which are very popular in the food and pharmaceutical industries are extremely dangerous in explosive applications. Atex permits for motors and other electrical operating devices generally apply to temperatures between -20 and +40 °C. 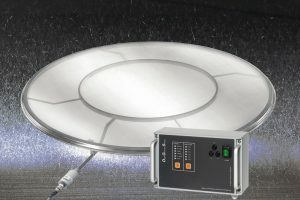 Measurements on pumps and other aggregates have shown that, even if the hood over a motor has a relatively open design, temperatures of 60 or 80 °C are not uncommon. The temperature inside the cover must therefore be monitored and must not exceed 40 °C during operation; otherwise, the ex-certification for any electrical components inside is no longer valid. The same is basically true for noise insulation hoods, although these are significantly better insulated and sealed than simple cover hoods. In order to use hygienic covers and sound insulation in explosive areas, the hoods must have interior cooling. Internal cooling systems are often insufficient due to the limited cooling surface. In this case, a temperature-controlled ventilation is the only alternative.